Satellite imagery at resolutions useful for military and intelligence purposes has historically been available only from satellites developed, launched, and operated by governments. As a result, access to and dissemination of the high-resolution satellite images was tightly controlled in the interest of national security. Since 1999, however, commercial satellites have made high-resolution images publicly available at a relatively low cost. In the United States, the Land Remote Sensing Policy Act of 1992, which was motivated in part by Russian willingness to sell declassified 2 m resolution military satellite imagery in the early 1990s, provided the legal foundation for private ownership of American remote sensing satellites. In 1994, the Clinton administration issued guidelines for the licensing of commercial remote sensing satellite operations. The resolution of an image is the size of the smallest object that can be depicted, and the best images currently available from commercial satellites have resolutions ranging from 50 cm to 1 m. Imagery from the most recent intelligence satellites launched by the United States government, in contrast, is believed to have a resolution of about 2 cm. No images with this resolution, however, have been released to the public. Although there is no universally accepted definition of "high resolution," in part because its meaning changes as technology improves, at the time this article was written it was generally understood to mean resolutions of 2 m or less. 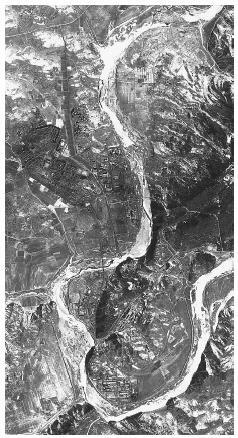 A satellite image showing the Yongbyon nuclear facility in North Korea taken in 2002. According to the Institute for Science and International Security (ISIS), significant facilities in the image include a five-megawatt reactor and cooling tower, and a spent fuel storage building in the bottom of the site near the river. was founded by a consortium of firms from the United States, Japan, and South Korea. The satellite was launched in August 1999 after the first version was destroyed when its launch vehicle malfunctioned and crashed the previous spring. 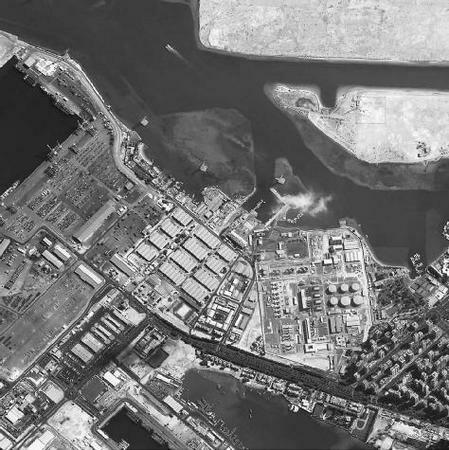 A view of the port and downtown areas of Abu Dhabi made by the QuickBird satellite provided by DigitalGlobe. QuickBird snaps some of the most detailed satellite images available to the public. based on technology originally developed for Israeli intelligence satellites. The successor the EROS A1, known as the EROS B1, is scheduled for launch in late 2004 and is expected to produce both panchromatic and multi-spectral color imagery with 0.87 m resolution. The highest resolution commercial imaging satellite currently in operation is QuickBird, operated by the Colorado-based firm Digital Globe, which follows a sun-synchronous orbit 450 km above Earth. The first QuickBird was lost in space after a late 2000 launch from a Russian facility in Siberia. A replacement was successfully launched from Vandenberg Air Force Base, California, atop a Delta II launch vehicle in late 2001. QuickBird supplies 0.62 m resolution panchromatic images and 2.4 resolution multispectral color images. Proponents of commercial high-resolution imaging satellites argue that their images will be useful for a variety of civil work that includes infrastructure monitoring, natural disaster recovery, endangered species habitat identification and monitoring, and natural resource exploration. Commercially available high-resolution images can also be used to monitor troop and equipment movement, observe construction activity, identify targets in inaccessible areas, and remotely assess battle damage. This has led the United States government to prohibit its licensees from obtaining or selling high-resolution imagery of Israeli territory in response to concerns raised by the government of Israel. It also reserves the right to restrict operations during times of national security emergencies. These restrictions do not apply, however, to commercial satellites operated by companies outside of the United States. Bossler, John D., John R. Jensen, Chris McMaster, and Chris Rizos (editors). Manual of Geospatial Science and Technology. Mount Laurel, New Jersey: Taylor & Francis, 2001. Campbell, James B. Introduction to Remote Sensing (3d edition). New York: Guilford Press, 2002. Baker, J.C. "Commercial Observation Satellites: A Catalyst for Global Transparency." 2002. < http://www.imagingnotes.com/julaug01/global.htm > (12 April 2003). "Digital Globe." < http://www.digitalglobe.com/ > (12 April 2003). "ImageSat International." 2003. < http://www.imagesatintl.com/ > (12 April 2003). "Space Imaging—Visual Products. Visible Results." 2003. < http://www.spaceimaging.com/ > (12 April 2003).